In the fall of 2014 and the spring of 2015, we facilitated two residencies in Austin, TX as part of our new arts initiative called The 5th Wall Project. 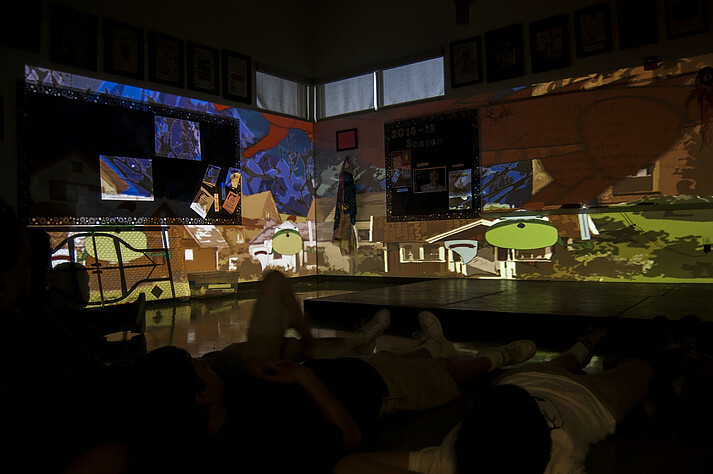 The goal of project was to combine dynamic projection design with creative storytelling and performance in a way that allowed students to view and experience their stories in new ways. During the project, we worked towards integrating the elements of theatrical projection and storytelling into a cohesive workshop. 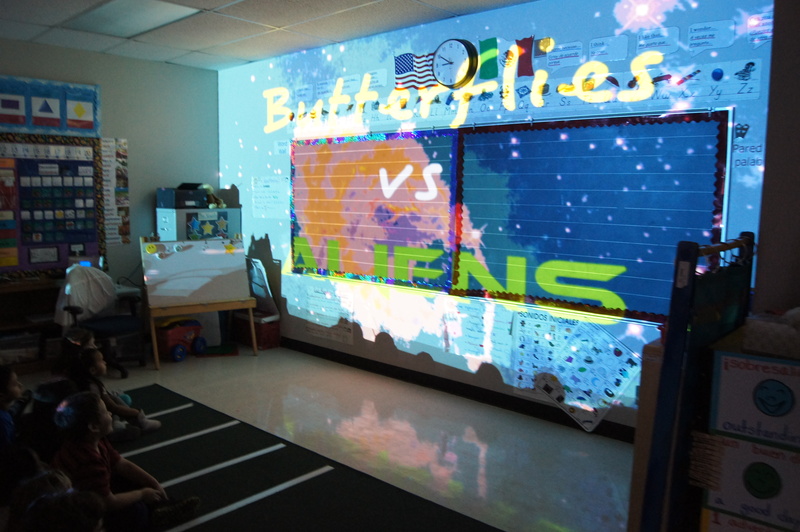 The workshops invited students to write, design, and record stories that we then edited together and projected onto the walls of their classroom. Along the way, we discovered how to create a balanced collaborative environment that placed equal emphasis on both art forms. This post serves as our reflection on the collaborative process and what we discovered through this partnership. Patrick: As a designer, I have always struggled with the desire to create work that is more than a visual experience – work that reaches and connects with communities in a more tangible way. As a projection designer, I found a tool that had an enormous amount of potential for exciting and innovative applications outside of a traditional productions. Yet it was not until I met Briana that we were able to identify and focus that into a mission and method for the project, aimed at working with students in schools. It was important to me that the work was geared towards encouraging young people’s imaginations, and Briana’s experience in the area of education brought clear and exciting life and direction to our goals. Briana: When Patrick first approached me about potentially working on The 5th Wall Project, I was excited to see what the partnership between a teaching artist and designer might look like in an educational context. We wanted to see how we could create a project that placed equal value in both the design and the storytelling components of the final projection product. As many theatre educators and teaching artists know, students and teachers alike can sometimes place a stronger emphasis on the “performative” elements of theatre, and without thoughtful planning and intentional lesson design, students might begin to see technical positions as secondary to the roles of the performers. As collaborators coming from two different fields – myself from a performance/education background and Patrick from a design background – we were careful to place equal weight on both the design elements of the work and the audio performances given by the students. Patrick: Through projection, I hoped to present imagery that was surprising, and transformed classroom spaces. My partnership with Briana took that idea out of the vacuum it existed in, and together we explored how and why those transformations should occur. Our partnership was so successful because we were both theatre artists, collaborative by nature, and we worked with each other more holistically, instead of simply dividing tasks due to expertise. This is not to say that we each did not take the lead on certain aspects – I was in charge of the animation, and Briana crafted our lesson plans and session structure, but all of the work was still done in an open, conversational environment. The design and artwork of the animations and stories were only created thanks to the structure of how our sessions with the students were organized, which was in turn guided by the technology and educational goals of The 5th Wall Project’s mission, creating a self-perpetuating cycle of collaboration. Briana: In the first iteration of the project, we worked with a kindergarten class in a local Austin elementary school. When designing the workshops, we thought a great deal about the structure of the process and the aesthetics of the product. In order to attempt an equal emphasis on audio story and visual design aesthetics, we chose to use both the students’ voices and artwork in the final piece. As young students are often eager to see their work on display, this proved a fruitful approach, as the students were thrilled to see their drawings and hear their voices in the final product. We were just as delighted to work on pieces that depicted a character named “Applehead” going to the store, a brave knight named “Jim Jim” making his way through a creepy castle, and a butterfly who befriends a group of aliens and invites them over for “a happy space party” – https://www.youtube.com/watch?v=hsER4nNr5m0. When we transitioned the project to a 5th grade context, we decided to heighten the aesthetics of both the students’ audio recordings and the final character designs that appeared in the projections, as a means to help students better understand the process of creating a fully-fledged piece of animation. In this iteration, half of the class worked with Patrick on in-depth character design, while I worked with the other half of the class to develop and record lines of dialogue for each character. In some ways, the design process post-production took even more focus, as Patrick worked to transition the specific character designs into fully-fledged animated characters. On the day of our final sharing, a good portion of our discussion after viewing the projects pertained to how designers in different fields might transition character renderings into digital media. Patrick: I believe that often theatre educators are asked to wear many hats, while designers have much narrower roles that remain fairly constant, framed inside the context of a production or creative team. This experience showed me the value of stepping outside those titles and roles, and demonstrated how much we can all grow as artists, generally, when working with a partner who shares a passion for a particular vision. Briana and I were able to set broad goals to begin with, and then use our combined training and expertise to execute and create what I believe to be a meaningful and progressive project. We began knowing we wanted to make an impact, using an innovative technology, on the lives of young people. The shape that it took from there, and continues to take, are all driven by those simple ambitions. Briana: Part of what I believe made this collaboration so successful was our unified focus on the element of story and the use of projections within the classroom. Both Patrick and I shared a desire to create a workshop environment in which students felt like they could create dynamic original stories and then see those stories come to life through the combined forces of projection design and audio narration. Because of our central focus on creative storytelling, our other elements of audio performance and character design were needed in equal parts to successfully meet this goal in a projection context. I also believe that because we chose to explore storytelling through full-room projection, the medium itself demanded that both elements take precedence in equal parts. As two collaborators looking to start a new partnership that places each of our art forms as essential players in the final product, focusing on the performative element of a design medium certainly helped us achieve that balance. Working in this way provided us exciting opportunities for both of us to apply our art forms to new contexts and artistic products, and as each of us facilitated different portions of the lesson specific to our expertise, we got to learn alongside the students. As we look towards future projects, we both hope to find ways to continue striking this balance between teaching artist and designer. Originally from Wayne, Pennsylvania, Briana Bower is a M.F.A. candidate in Drama and Theatre for Youth and Communities at UT Austin. She received a B.A. in Theatre with a focus in Theatre Education from Northwestern University, and completed an honors thesis that explored the process of site-specific devising with youth. While in Chicago, Briana worked with Light Opera Works, School District 65, Dream Big, and Chicago Children’s Theatre, specifically with the Red Kite Camp. Before coming to UT, she was the Tour Manager for Child’s Play Touring Theatre, where she adapted and performed stories written by students all over the US, led summer camps, and developed cross-curriculum story writing guides. At UT, Briana is researching how object/arts-based performance projects impact youth identity formation and perception, and exploring the creation of site-specific performative installations that invite audience participation and interaction. Briana is the Education Director of The 5th Wall Project.